Stay at home mom, that was merely my job title for about 4 years now. My husband and I decided to just focus my time and energy for raising my dear Isobelle since she needs my time most. Hubby is at Saudi to manage our monthly bills and allowance and for our future of course. Now that we acquired a house and lot at Camella (I will probably make a long post about it, maybe after our move in), we need to cut out some of our expenses. We have to give up therapy sessions and I devote my time homeschooling Isobelle (basics only as I have limited sources). I have to cut my internet connection because the only connection I have to do is with husband. Good thing, Globe has offered free facebook app for a long time (not free anymore, but can still view facebook status without photos, and upload too!) and facebook messenger until now. I survived having no internet for 3 years then I learn about the Globe Promos and really use it for good. Sometimes, I gave up a day or two because I am so stressed out with day to day activities at home. I always miss my activities outside, I miss reading a book or watching series but I can't seem to finish one because I have a kid to tend to, a husband to talk to over wee hours and a full day preparing and cooking meals for me and Isobelle. It was like "ganito na lang ba palagi ang role ko?" and sometimes I whine over husband to just let me work. Although I know that it is impossible to do because there are also other factors I need to consider. Who will tend to Isobelle for the whole day? Will I be able to manage my time then or will I just be more stress since I am full time working and attending a kid after. Argh. So many things to think of. Until my cousin propose a project for me. She will pay for my internet fees since I am hesitant to have one because it might add to our expenses. I just need to help her manage her business at Arizona. She will be building a small company that will help micro and macro business around her area. I was ecstatic because finally I have a new world to dive into. But I also ask her if she can really handle the expense because I won't be able to pay for it if it does not come up successfully. Then she agreed. The first month was a zombie phase. I don't have nothing to do and since husband is here for vacation, I have the tendency to look for a job and get back to my online work portal before. Apparently, there are so many changes unlike before. It is not that easy to find one. Getting frustrated after a few tries, finally I landed on a fixed job for a small cost. It doesn't matter, I said. As long as I can get by and I need a part time to since I am still waiting for my cousins go signal. It was also a blessing in disguise when my cousin broke the news to me that she have to attend to something more important so I told her I was looking for a job for quite some time around since we didn't have started yet. But, whenever she needs me, she can still ask for my time, besides she's still the one who will pay the internet I am using. But I also told her that when things aren't working at her end, and I got a pretty decent job that can cover the internet fee, then I would like to step up for that. Since I know that she also has some bills to pay, I wouldn't like to be one burden for her. After the fixed price job, I also got some interviews along way and yay for an hourly job that doesn't demand me to work fully. I only work for him to help him manage his expenses. Pretty easy but rewarding on my part. After that I also got hired for a transcription job, fixed price and they want to absorb me to work on them fully. Wow, that was such a blessing really. I am still praying for that because sometimes, whenever I slip things on my mouth, it doesn't push through. So for now, I am not a SAHM anymore. 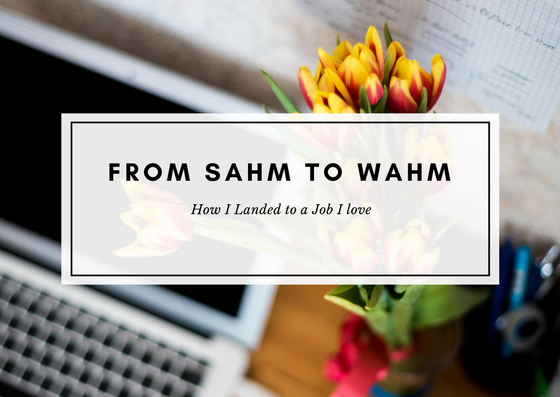 I am now a WAHM. I just got promoted! 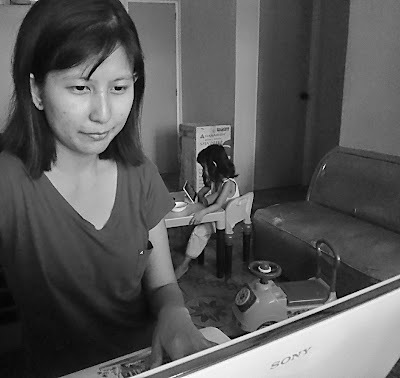 Work at Home Mom here, but don't worry I will still update my blog from time to time.